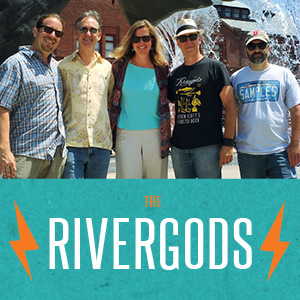 The Rivergods will make our debut at Bill’s Seafood in Westbrook Saturday, March 30! We’ll play two long sets start at 7:00pm. Mark your calendars. We’ll “sea” you there… ! We’re back at Daddy Jack’s Saturday, Feb. 23… mark your calendars! We’ll be going on early, at 7pm, so make your table reservation at (860) 444-8888. Oh, and it’s Ben’s birthday, so you never know what might happen… See you there! More info. Happy 2019 y’all! Hope everyone survived the holidays. If so, or if not (!) join us Friday, Jan. 11 at Daddy Jack’s in New London, CT for some post-holiday new year cheer. 7:30pm start time, no cover. Great food, great atmosphere! See you there… more info. Ben and Nancy will perform as duo for the 5th annual Pass the Guitar event Friday, November 2nd at 7:30pm at All Souls Unity Hall, along with a couple of dozen other southeastern CT musicians, to benefit the New London Homeless Hospitality Center. This year’s concert (Pass the Guitars, plural) will feature not one, but two guitars, for an evening of 15 duets and ensemble performances. Admission is $10 at the door, and light refreshments will be provided. Hope to see you there! More info. A year ago this month, we lost one of the great American songwriters… the inimitable Tom Petty. We’re not sure we ever met a person anywhere who didn’t like *something* by Tom Petty… his unique style cut across most ages and genres. His band, the Heartbreakers, were second to none… probably one of the greatest rock ‘n’ roll bands to have as long a run as they did (40 years) and a huge influence on our band and music. They got better and better with age, as did Tom. On Saturday, October 20, what would’ve been his 68th birthday, Pettypalooza will celebrate the life and music of Tom Petty at Hygienic Art Park with sets by three great bands including the Rivergods, Learning to Fly and Slick & Slate (from NYC, featuring Earl Slick, former guitarist for John Lennon and David Bowie), playing one long celebratory night of Tom’s own music, and the music he loved. The show starts early, 6pm, and we will go on first, playing a bunch of Tom’s songs, and some by artists that he either took influence from, admired or played with. Advance tickets for Pettypalooza are $15, on sale now at Hygienic.org ($20 at the door). A portion of the proceeds will benefit the Connecticut Humane Society. It should be a big night at the Art Park, so you may want to get tickets early. Thanks, Tom, for all the incredible, inspiring songs… We look forward to celebrating and playing some of your music on your birthday! Due to weather, our August show at Captain Scott’s Lobster Dock was postponed. But not to worry, we’re rescheduled forSaturday, Sept. 15, same time! We’ll do a couple of long sets, one leaning more acoustic, and one more rockin’. Sound by the always great Dennis Walley. Great food, great venue, great people. See you on the dock in September!